Red Rock Crossing near Sedona Cathedral Hideaway in Sedona, Arizona Only a 7 minute walk to this famous, iconic view. You are close to town – just three miles away. This gives you easy access to shopping, theaters, tours, plays, art or music festivals and exceptional restaurants. Or just sit and relax at our two-acre property of pine and juniper trees and be at peace while watching the Gamble’s Quail, hummingbirds and other wildlife. When it comes to sightseeing we will give you guidance on historic sites, scenic trails, famous artists and sculptors, and restaurants that only the locals know about. You can hike some of the most beautiful trails in the world right from our property. We can guide you to trails that are most suited for you, or maybe you prefer to experience the red rock wonders by air, on horseback, bicycle or a Sedona Jeep Tour. For those interested in the vortexes and metaphysical community, we can guide you in the best direction for that special experience. If you fly into the Sedona Airport, we will be happy to pick you up and bring you into our home or to your rental car. Some great Sedona activities just minutes from the Sedona Cathedral Hideaway! Call us to give you the latest update on these activities. We will be glad to make the reservations for you. Fall colors in Sedona, Arizona – A 5 minute drive to Crescent Moon (Red Rock Crossing) Park overlook. Come here in October and November for amazing Sedona and Flagstaff and Cottonwood fall colors. A photographers dream. Amazing Fall colors with Cathedral Rock in the background, viewed from our bed and breakfast windows and grounds. 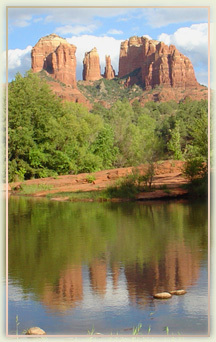 Sedona Activities – We act as concierge for you. We assist you in finding the best activities for you. October – 21st – 22nd, 2017 just two miles up the road at the Red Rock high school. If parking is difficult we will drive you there and pick you up. For information about the annual Sedona Gem & Mineral Club show, visit our SHOW page. The show is held annually on the third weekend in October at the Sedona Red Rock High School on Upper Red Rock Loop Road in West Sedona. Hours are 10:00 AM – 5:00 PM Saturday and 10:00AM – 4:00 PM on Sunday. 2017 show dates are Oct. 21st – 22nd. October 31st – Halloween in Uptown Sedona. What great fun to see people with their kids and pets all dressed up and walking through Sedona Uptown stores. There is always a Michael Jackson “Thriller” dance show on the street, given by our local talent. This is a must see and lots of fun. There is public transportation to help you get there without trying to find a parking spot. We can drop you at the bus stop which is five minutes away. We have over 1000 hummingbirds at our feeders at this time of year. We also have many professional hummingbird photos taken by Kathy Masters-Jaeckel, Co-Owner. 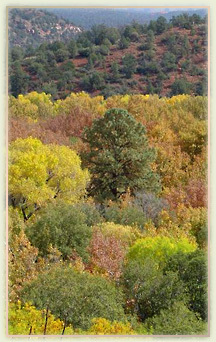 See our photos section of our website for Sedona wildlife and landscape, http://kathyjaeckel.pairserver.com/rooms-and-rates/photo-galleries/ or go to http://MastersImpressions.com for a more extensive sample of her photos. There are hundreds more on site. February 2018 – Sedona Film Festival. Check website for exact dates. Book your stay at Sedona Cathedral Hideaway for a week and see many of the films at Sedona Red Rock High School just two miles away and The Performing Arts Center. March 2-4, 2018 Sedona Mountain Bike Festival. Held at the Sedona Posse Grounds on Posse Grounds Rd. off 89A. A Red Rocks Music Festival every summer. Check internet for dates and time. http://www.redrocksmusicfestival.com – Sedona Creative Life Center. It is a 15 minute drive to the Center. on the trails looking for a quiet special experience. We have many bike and hiking trails leading right from our B&B. Bring your bike with and we will store it for you. Parks – There are over 140 marked trails in the area. You can access several trails right from our home. Red Rock Crossing / Crescent Moon Park – Where Cathedral Rock reflects in Oak creek. A 5 minute walk from us. Red Rock State Park – Educational park with ranger tours and full moon evening hikes. A 10 minute drive from us. West Fork Trail – One of the preferred trails in the warmer weather because it is at a higher elevation and is cooler. Slide Rock State Park – A fun way to cool off in the summer in Oak Creek Canyon. Grasshopper Point – Just past Uptown Sedona. It is right on the creek and very picturesque with trees and rock views. Our Red Rock Pass does not cover the entry fee for the above parks. Fee is either $9 or $10 per car as of June, 2016. There may be an additional fee for more than 4 people in each car at some of these parks. Verde Canyon Railroad – A relaxing afternoon on a train with some appetizers. We can make your reservations and make suggestions on where to sit for the best view.